Rep. Jahana Hayes joins House Speaker Nancy Pelosi for a ceremonial swearing-in ceremony. U.S. Rep. Jahana Hayes began her congressional career Thursday kissing babies, casting votes to reopen the partially shuttered federal government, and keeping watch for news about a daughter who was due — at any minute — to give birth. “This is a big day for me in many ways,” Hayes said. A Democrat representing the 5th Congressional District, Hayes replaces retired Rep. Elizabeth Esty and was propelled to office by enthusiastic supporters seeking change and enamored by the energetic, optimistic can-do-ism exuded by the former national Teacher of the Year. “Can you believe we’re here?” she asked the throng of supporters jammed into her congressional office. That office is in the Longworth House Office Building, a nice suite of rooms with a panoramic view of Washington D.C. that she snared by getting a low number –12—in the pool that distributes available office space to new members. “This is okay, right?” she asked those attending her office reception, waving her arms around the room. Po Murray of the Newtown Action Alliance, a gun-control group, was among the crowd of several dozen people attending Hayes’ reception. “I’m really excited to work with her to make Connecticut and America safe” Murray said. Hayes has been lucky in many ways. Her hardscrabble life story, which includes growing up in public housing and becoming a teen mom, drew national attention – and lots of campaign cash – allowing her to defeat the Democratic party-endorsed candidate in a primary and Republican Manny Santos in November’s general election, without having ever held political office before. A bus filled with 75 supporters came to Washington Thursday to witness the swearing in of the first black congresswoman to represent Connecticut. “I only had two tickets to the swearing in, but they said they were coming anyway,” Hayes said. Her first day in Congress did offer some challenges, however. Hayes could barely speak, laryngitis that she said was the result of a recent illness. “But I’m doing better than yesterday when I couldn’t talk at all! And I was able to vote!” she said, referring to the roll call vote held in the House on Tuesday for House Speaker. Like all of Connecticut’s House members, Hayes voted to elect Rep. Nancy Pelosi as Speaker. Shortly before that, all newly elected and re-elected House members were sworn into the 116th Congress. Across the Capitol, on the Senate floor, Sen. Chris Murphy was also sworn in. Hayes had another first-day snag. Somehow her vote on a procedural measure on Democratic legislation that would reopen the government was not recorded. The House cloakroom called her office and she ran back to the Capitol to cast the vote. Before having to flee her reception, Hayes had picked up a print of Norman Rockwell’s iconic painting of a six-year-old African-American school girl being escorted by four U.S. marshals to her first day at an all-white school in New Orleans — four years after the Supreme Court’s Brown v. Board of Education ruling ordered the desegregation of public schools. Hayes said her husband Milford gave her the print after she won the Teacher of the Year award and it will be hung prominently in her office. Hayes said many things surprised her about the opening of the 116th Congress. “But mostly I’m surprised that we got right to work,” she said. Besides electing the Democratic and Republican leadership, and a new set of rules for the House that requires all bills to be subject to committee hearings and reviewed for at least 72 hours before a vote, the House prepared to vote late Thursday on Democratic legislation that would fund the agencies that have been shuttered in the partial government shutdown. The shutdown began Dec. 22 and will last until the end of the federal fiscal year, Sept. 30, unless an agreement can be reached between Congress and the White House. 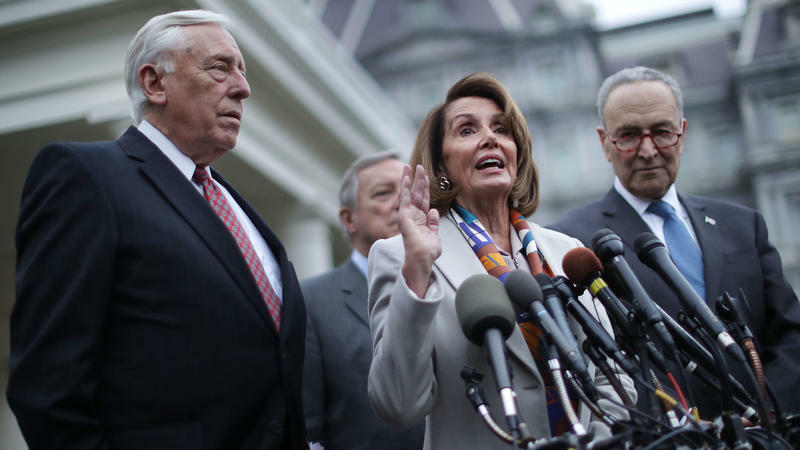 Under the Democratic legislations, the only agency that would receive short-term funding – until Feb. 8 — would be the Department of Homeland Security, which would allow discussions to continue between congressional Democrats and President Donald Trump over border security money. The president, who insists any bill that reopens the government contain $5 billion for a wall or fence along the U.S.-Mexico border, has rejected the Democratic plan to reopen the government. Hayes said she’s frustrated by the shutdown, a result of deep party divisions in Congress. “People should grow up and act like adults and do the job they were sent here to do,” Hayes said, sounding very much like a teacher. In the late afternoon, she attended a ceremonial swearing-in with Pelosi that was attended by her husband and children (minus the daughter who is about to give birth). Hayes also formally joined the Congressional Black Caucus on Thursday, a group of Democrats with growing influence in Congress.